This card’s name becomes “Dark Magician” while on the field or in the GY. Your opponent cannot target Spells/Traps you control with card effects, also they cannot be destroyed by your opponent’s card effects. Can we all collectively say, “Finally?” Dark Magician the Dragon Knight was a long time coming, a true boss monster that might just be the first card in the Dark Magician archetype that can truly make an opponent sweat. This guy with Eternal Soul is practically a win condition. Besides being Safe Zone on Master Key Beetle version 9.0, Dark Magician the Dragon Knight is also nearly Kaiju proof, which might be a first and it’s what makes him truly fearsome. What counter is there for him? Battling is a pitch in the dark, especially with Apprentice Illusion Magician looming, and Kaiju does nothing with Eternal Soul on the board. Eternal Soul truly becomes eternal, being able to revive the Dragon Knight over and over, a crushing obstacle for opponents who previously knew how simple a task it was to beat Dark Magicians. All you had to do was kill the right spells. Now what do you do? The true topping to this amazing cake is how incredibly well Dragon Knight harmonizes with link monsters. Use him as material for a link monster and bring him right back with Soul or any number of other cards. And just like that, all your stuff is safe once again, but you can start working toward Firewall Dragon or Decode Talker. It’s a shame that Dragon Knight is level 8 when all of Dark Magician’s prior extra deck support is level/rank 7, but can we really complain? The only real downside to all this is the unfortunate problem of The Eye of Timaeus being unsearchable, which is a downright travesty that hopefully gets corrected in the future. In the meantime, Dark Magician continues to challenge with new support that will periodically refresh itself. But finally, Yugi’s old standby is truly in style. Definitely a top 10 card of 2017 and a boss monster for the ages. Legendary Deck week on Pojo and even more Dark Magician support is alright with me. 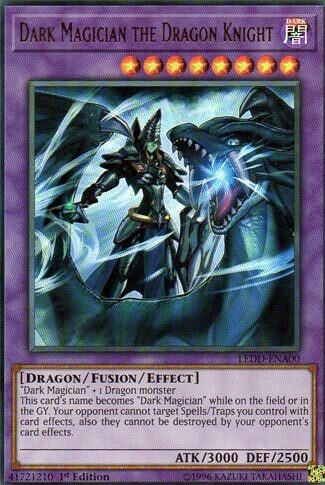 Dark Magician the Dragon Knight (DMtDK) is the Fusion monster the archetype needed. Dark Paladin is great, Amulet Dragon is useful, but neither do quite what DMtDK can do. A Dragon-Type monster and a “Dark Magician” is easy to come by, especially when using the Eye of Timaeus to summon this monster (sadly the Eye of Timaeus isn’t searchable within the archetype). Great stats and even better effects. Protection for ALL your spell/traps will protect your Dark Magic Circle and Eternal Soul, cards which can combo with DMtDK because it is treated as “Dark Magician” on the field and in the grave. Reborn it with Eternal Soul and you have a monster that is almost unbeatable. Eternal Soul protects it from card effects, DMtDK protects Eternal Soul from card effects. This card is the overpowered card the archetype has been dreaming about. The only way this guy is going away when attached with Eternal Soul is through battle, and 3000ATK is tough to get through. Easy to summon within the archetype, strong, support behind it, insane protection ability, and can be summoned over and over. I love the concept of the Legendary Decks. Brings something unique to the table. Yes, we will be looking at cards from the Legendary Decks this week and probably the next two weeks as well. The first week is the Yugi Deck with a new Timaeus Fusion, and he is the first to review this week. I introduce you to Dark Magician the Dragon Knight. You’ll likely summon this with Timaeus, but he does require Dark Magician and a Dragon Monster if you want to Poly or whatever. His name becomes Dark Magician on the field and in the GY, which is awesome for cards like Dark Magical Circle, Eternal Soul, Dark Magic Attack, etc. He also protects your Spells and Traps from destruction and targeting, which is great because Dark Magical Circle is great removal in the Dark Magician deck and you won’t have to worry as much about your opponent doing something to your Eternal Soul, which will destroy your monsters when it leaves the field. I honestly like this card. Doesn’t open up more plays, really, but it protects some of the great Spells and Traps the Dark Magician arsenal has. This is another week that looks like I could have picked, but again, I have not. Dark Magician the Dragon Knight is awesome, in a word. He’s a Dark Magician variant that happens to actually be playable. Quite playable, and quite good. Easy enough to Fusion Summon with DM and one generic Dragon (and alternate means are welcome, and he’s not limited to only being Summoned by Fusion) and has 3000 attack to boot. His name becomes Dark Magician while on the Field or in the Graveyard, which isn’t a problem, and only opens him up to use the wide array of weapons in DM’s arsenal. As for what he does that’s so awesome, he protects your Magic and Trap cards. He’s more fun than Jinzo. For another comparison, where Dark Paladin can negate and destroy, which is almost always better, here, the protection is better, in my opinion. Expect to see this guy, and a lot of him, probably for a long time. Previous articleThe Outrage Bros. is Back! Reshiram & Zekrom SM Shining Legends! Next articleLinkuriboh: Goat Format 2018?